Note, the Texas Department of Public Safety has a great FAQ page as well. Do you offer the Advanced Rider Course (ARC)? No, Total Rider does not currently offer the ARC/MSRC. The Advanced RiderCourse is designed for experienced motorcyclists and includes advanced riding techniques on a full-size range. To find an ARC class near you, visit www.dps.texas.gov/msb and select Training Locations, then look for a location in your city that has the word Advanced in their Curriculum description. Attn Army: The Department of the Army POV Task Force has affirmed that the ARC will substitute for the Military Sport Bike Course for sport bike riders, and will be the equivalent of the BRC2 for Non-Sport bikes. 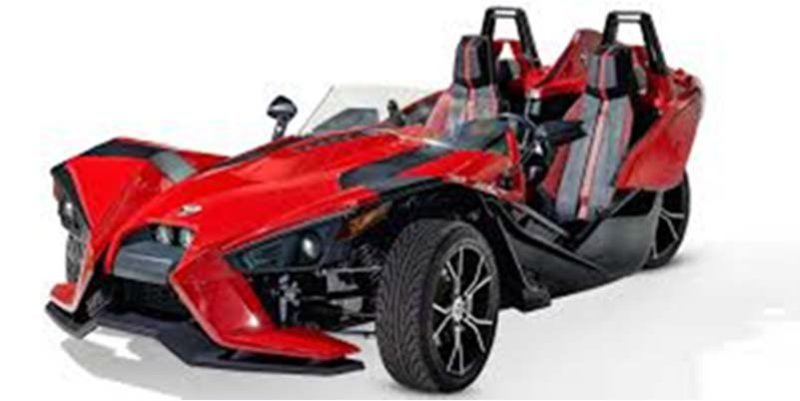 Do you offer three-wheeled motorcycles (trikes or Spyders) training? Unfortunately, TR doesn’t currently offer 3-Wheel classes at this time. You may want to check out the Can-Am site for more info and where classes may be offered. Note, if you are trained on a 3WMC your license will be restricted to only a 3WMC. A 2-wheel “M” endorsement covers all 2 and 3-wheeled motorcycles. Students are required to use three-wheeled vehicles during the riding portion of the class. For the classroom portion: All books and study materials. You are welcome to bring a snack and drink, but please dispose of afterwards. For the riding (range) portion: A motorcycle, and a helmet. You are welcome to bring your own helmet as long as it is DOT approved. You are also welcome to bring a snack and drink, but please dispose of afterwards. Be sure to read your booking confirmation email about wearing proper clothing for the riding portion. If you do NOT bring the REQUIRED gear to riding practice you will not be allowed to participate in the class. You will forfeit your course fee and have to pay for another class. Does Total Rider offer discounts? Total Rider offers a $15 discount off our full-rate BRC and BRC2 courses for military, police, firefighters, EMS, school teachers, and other public servants! Please contact us to arrange the discount before you book your course. Be prepared to show ID upon entrance to class. This discount can not be combined with any other in effect. We also offer discounts at various times during the year via our website, Facebook page, and our TR Partners. Please read as you will be essentially entering into a contract with Total Rider, LLC once you pay your class fee. Even if you allow someone else (like a dealer) to book your class for you or your book over the phone, our policies still apply. What if I do not show up for my class? Like missing the bus, classes will go on without you. we provide a one-time “Hall Pass” per student for an additional $75.00 administrative fee *(Does not apply to BRC2uLW). Email our office staff via our website’s Contact Us page explaining your situation in detail, or call (512) 522-5844 Monday through Friday, 9am-5pm. do not show up or arrive late for any classroom training, and have already used up your one-time “Hall Pass”. arrive late for range training – period. Classes go on rain or shine, hot or cold unless Total Rider cancels the class due to severe weather. See our weather faq. $25.00 Admin fee if Total Rider is notified 4 or more days prior to the scheduled class date. 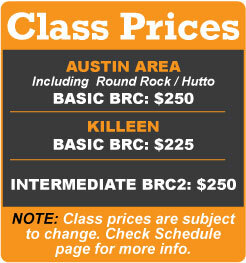 $75.00 Admin fee if Total Rider is notified 3 or fewer days prior to the scheduled class date. Total Rider assumes no responsibility for classes missed as a result of illness, emergencies, or other events beyond our control. We also reserve the right to cancel classes for any reason deemed necessary including classes not filling or scheduling conflicts and will notify you of that occurrence. If you are under 18 years of age: As a minor, you must have a valid learner’s permit or driver’s license to take our courses. In addition, participants under 18 years of age must have medical consent and course waiver forms signed by a parent or guardian in person at the training location or the forms must be notarized. What if I get “counseled out” of a course? Students unable to keep pace with the class or who pose a hazard to themselves or others may be dismissed from the class by the coach. There will be no refunds, pro-rated or in full, should a student be dismissed by the coach. Please understand that these courses have group learning format that limits the ability of the instructors to provide individual instructions to students. These courses are mentally and physically demanding, and weather conditions can increase the stress on students. Can I study course materials before class? What a great idea! Sure you can… just point your browser here. Please be aware there is a written test at the end of the classroom portion on day 1 in which you must score 80% or better. A failure of any part of the course results in a failure of the entire course. Classes go on rain or shine, hot or cold! (unless Total Rider cancels class due to severe weather). Dress appropriately, wind and rain can make temperatures seem much colder. On hot days black clothes absorb sunlight so avoid those if possible. Read your confirmation email as it contains important information on what to wear. Our instructors will delay or cancel a riding class if necessary. Typically we never cancel the classroom portion of your training. However, the coach must delay the class in the event of lightning or other severe temporary conditions until it is safe to begin again. If you leave the riding area and the class was not canceled by the coach you forfeit your tuition fee and must begin the class from the beginning. Also, review our cancellation and refund faq. What if the training motorcycle doesn’t fit me? Occasionally a student will come to class who doesn’t feel comfortable on our training bikes because of height or fitment issues (e.g. their legs are too short, or too long, or their hands get tired because they’re too small, or they are using different muscles). Very rarely are our training motorcycles too tall or too small for the student. We use 125cc and 250cc motorcycles. The shortest student we have trained was 4’6″ and weighed approximately 88 pounds. The tallest was approximately 7’4″ and weighed 450lbs. Both of these students completed the course successfully on our training bikes. We use motorcycles with the lowest seat heights available and the lightest weights available. If you are concerned about sitting comfortably on one of our training bikes please visit any of our dealer partners to sit on a comparable motorcycle before enrolling in our class, or contact us. We can try and arrange an onsite visit during a class so you can sit on a motorcycle. 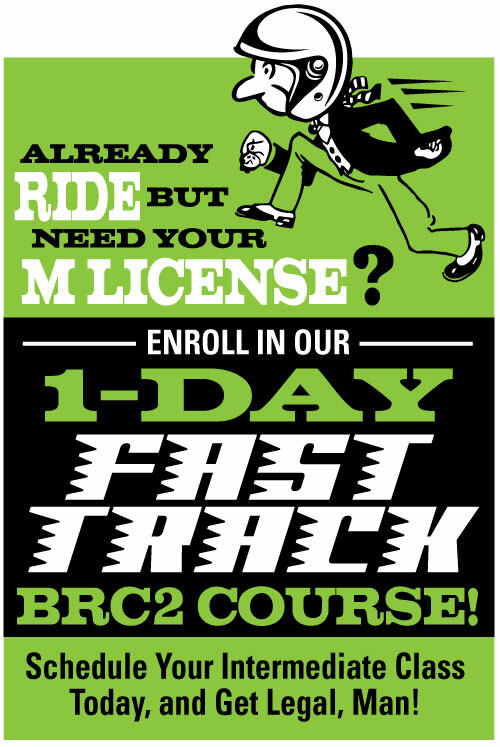 Is the Basic Rider Course (BRC) required for a motorcycle license? Yes, effective September 1, 2009, a law passed that required successful completion of an MSF Basic RiderCourse. This applies to all riders 18 years of age and older or if you held a motorcycle license which has since lapsed. If you are under 18 years of age: as a minor, you must have a valid learner’s permit or driver’s license to take our courses. In addition, participants under 18 years of age must have medical consent and course waiver forms signed by a parent or guardian in person at the training location or the forms must be notarized. We HIGHLY recommend you make two copies of each of these forms and bring one set to the classroom portion, and one set to the range portion. If you have a motorcycle with a “J” or “K” restriction you may take the motorcycle on-cycle skill test at your local Driver License office instead of taking the Course. Total Rider does not accept cash or checks at its classrooms or range locations. Our coaches are not allowed to accept cash or checks. As of February 2017 we now accept PayPal as a way of paying for your course, in addition to credit and debit cards. Do you take deposits for classes? At this time we do not take deposits for classes. Classes must be paid-in-full at the time of booking. No, Total Rider does not provide scooters at this time. I lost my certificate! What can I do? How long are they good for? If it has been less than 4 years since you took our course then we can replace your MSB-8 certificate for a $10 fee. Please visit our Lost MSB-8 Certificate Replacement Request page to get started. If it’s been longer then you’ll need to contact TX DPS by browsing to http://dps.texas.gov/msb/msbfaqs.htm, then scroll down to #8 where you will find more information on how to obtain a replacement certificate. On May 22, 2015, the Governor signed SB449 which created a new definition for an autocycle in Texas. The bill became effective immediately. Below are some common questions regarding the new autocycle registration, licensing and operation in Texas. In addition, the Motorcycle Safety Unit in ETR regulates and sets rules for motorcycle training in Texas and publishes information on motorcycle, autocycle and ATV definitions and requirements chart for your review and dissemination. What is the definition of an autocycle? (4) manufactured and certified to comply with federal safety requirements for a motorcycle. SB449 amends TRC Chapter 521 where an autocycle can be operated on a Class C license. This is because an autocycle is stable, has a steering wheel, and uses the traditional throttle and brakes like a motor vehicle does. For purposes of titling, registration, and inspection an autocycle will be considered a motorcycle. This is because the autocycle cannot meet the definition of a motor vehicle as required by federal statutes (airbag, crash ratings, enclosed, etc). The autocycle can meet the federal definition of a motorcycle as built so that is why the manufacturer can issue a certificate for a motorcycle. Do riders of an autocycle need to wear a helmet? Yes, SB449 amends the helmet section requiring a helmet. The standard exemption from the helmet requirement of having sufficient insurance also applies to an autocycle. Peace officers cannot stop a motorcycle or autocycle for the sole purpose of determining if a rider is in compliance with this section. The autocycle is equipped with a safety restraint system, are riders required to wear the safety restraint system? State law does not require riders to put on the restraint system, but riders should comply with the manufacturer’s suggestions for safe operation. Does an autocycle have to have footrests and handholds like a motorcycle? No, SB449 exempts the autocycle from the footrest and handhold requirement. Can a child ride in an autocycle? SB449 amends section TRC 545.416 to state that passengers may only ride in the seat of an autocycle and an operator may not carry another person in an autocycle unlessthat person is at least 5 years old. What are the rules of the road for a motorcycle such as speed limit and lane operation? The autocycle must be operated in the same manner as a regular motor vehicle for purposes of TRC Subtitle C Rules of The Road. What does an autocycle look like?